For specific contracting opportunities with Skanska-Shimmick-Herzog (SSH), the joint venture selected to construct the line, track, systems and stations elements of the Phase I Berryessa Extension, please click here. 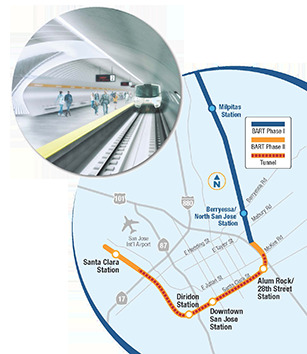 VTA's BART Silicon Valley Project has a number of available contracting opportunities. Companies or individuals who wish to submit proposals or bids need to be registered as a Prospective Vendor with VTA’s Procurement and Contracts Department. To register as a vendor and ensure your contact information is included on VTA’s planholders list, please go to the VTA Procurement Website. For inquiries regarding Phase I procurements, please contact Edward Lao at Edward.Lao@vta.org. For inquiries regarding Phase II procurements, please contact Ephraim Cadaing at ephraim.cadaing@vta.org. The Santa Clara Valley Transportation Authority (VTA) is constructing its second extension of the Bay Area Rapid Transit (BART) regional commuter rail system. The $4.7 billion, 6-mile, 4-station project begins at grade in San Jose, includes a 5-mile tunnel through the downtown area, and ends at grade in Santa Clara. This forum provided important information about the upcoming RFP for General Engineering Consultants. VTA encouraged DBE and SBE firms to participate. For inquiries regarding the GEC forum or Phase II procurements, please contract Ephraim Cadaing at ephraim.cadaing@vta.org.